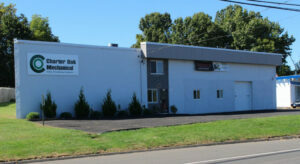 As an HVAC contractor we at Charter Oak Mechanical are your Connecticut heating, ventilation, air conditioning and refrigeration specialists. In New England they say if you don’t like the weather… wait 15 minutes! Connecticut weather can grace us with above average temperatures one day and dip into frosty chill the next. Your home is your haven – how is the climate inside your home? Talk to the premier heating – ventilation - air conditioning – refrigeration and custom ductwork contractors in Connecticut: call Charter Oak Mechanical. Charter Oak Mechanical is your local residential and commercial HVAC Contractor serving Glastonbury CT and all towns and villages in central and eastern Connecticut. Heating and cooling your home and business is our specialty. Charter Oak Mechanical has over twenty-five years of expertise HVAC, accredited by the Better Business Bureau. We save you money on energy efficient furnace installation, maintenance and repairs on the units you choose. The Charter Oak Mechanical staff is knowledgeable and professional. The Charter Oak Mechanical Guarantee states that if you are unhappy with your Home Comfort System’s cooling or heating and we can’t fix it, we will remove the equipment we installed and refund 100% of your original investment at any time during the first year. When you need an HVAC contractor that serves Glastonbury CT and surrounding town and you want the Best – call Charter Oak Mechanical at 860-432-8915. Ask about ductless mini splits!